Bruton Haulage Ltd is a sub-contractor for Tarmac Industries. Based in Greenwich, London, Bruton Haulage Ltd is known for taking away planings and hauling aggregates on behalf of Tarmac Industries. Incorporated in 2008, Bruton Haulage Ltd has a 24-hour operation in place. Since joining the FORS scheme, Bruton Haulage Ltd has seen a significant improvement in the quality and efficiency of their business operations, which can be seen through their KMPL figures. Managing director of Bruton Haulage Ltd, Michael Bruton, explains how FORS has been beneficial to their company. We were first informed about the FORS scheme through our supplier Tarmac Industries. After conducting further research into the scheme, we saw that FORS had all the appropriate tools to help us implement improved procedures into our business, to ensure that our operations are carried out at an optimal safety standard for our drivers and vehicles. After having achieved a bronze, silver and gold accreditation with FORS, we have been operating at our most efficient and safest standard since first establishing. When we began to work towards our initial bronze, silver and gold audits with FORS, we were provided with many toolkits and guides to help us implement better policies and procedures into our business. These improved policies helped us to ensure optimum safety to the public and other vulnerable road users from our vehicles and drivers. 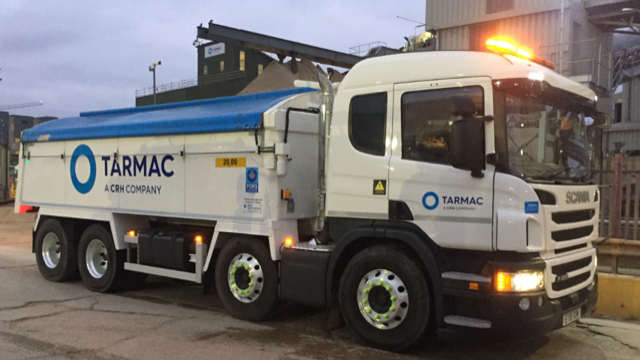 After seeing the development in our safety procedures achieved with the help of the FORS scheme, we were encouraged to continue working and improving with FORS by maintaining the changes made. Another aspect of FORS that helped us on improving our safety standards was the e-learning modules available to our drivers and managers. The e-learning modules in particular that proved to be very helpful and informative include the Cycle Safety, LoCity and Smart Driving modules. These modules helped our drivers and management implement new and improved safety techniques and methods into their job role. Moreover, another resource from FORS that we found very helpful in improving our company’s safety practices was from the classroom based learning courses. In particular, the Safe Urban Driving course proved to be very beneficial to our drivers, as it showed our drivers the view of the road from a vulnerable road user’s perspective. This experience made our drivers more empathetic with vulnerable road users and taught them skills they could implement into their driving to ensure other road user’s safety. At Bruton Haulage Ltd, we want to remain FORS gold accredited, as we believe the FORS scheme has helped us keep our accident figure at zero. As we have been operating for over 17 years, this is a notable achievement that we wish to maintain; and we believe continuing to work with the FORS scheme will help us maintain this achievement. In the ­­­­­last six months, we have increased our KMPL by 22.6 % thanks to FORS. At Bruton Haulage Ltd, we ask new employees to complete a health form prior to employment to ensure that they are fit to work. Moreover, we conduct an annual comprehensive medical declaration with our current drivers to ensure that they are still fit to work. If any health issues arise, we refer the employee to a GP for further consultation. Furthermore, we also ask that our drivers undergo regular eye checks. At Bruton Haulage Ltd, we do not recruit often as we only have one vehicle. However, we have a recruitment policy and a two week training program in place for when we do require new recruits. Having the two week training plan in place encourages drivers with no previous tipper experience to join the industry. At Bruton Haulage Ltd, we have implemented the FORS anti-idling technique into our drivers training to reduce our vehicles noise pollution production. Furthermore, our vehicle has anti-idling equipment installed to switch of the engine when it is not in use for a long period of time. Moreover, we use Masternaut tracking to monitor our drivers’ anti-idling. At Bruton Haulage Ltd, we operate in a tipper vehicle with a euro six engine installed along with an intelligent gear box and anti crash gear, together with vision glass installed in the passenger side door. Currently, there are no electronically powered vehicles or other methods of transport that are available to carry out our mode of work. At Bruton Haulage Ltd, we will continue to search for alternative modes of transport that we can implement into our business that would be more environmentally friendly. Moreover, we plan to continue working on our drivers and management’s professional development by keeping up to date with FORS’s e-learning resources. In addition, we will also continue to ensure that we have the best policies implemented into our business. To conclude, at Bruton Haulage Ltd, we hope to remain a FORS gold accredited company, to show our customers and the public that we are carrying out our business operations using the most efficient and safe procedures. Moreover, we look forward to maintaining our zero accident rate figures by continuing to work with FORS and implementing their recommended practice.